The newest Autoimmune Protocol Community Cookbook is out NOW! Following the success of the first community ebook, The Paleo AIP Instant Pot Cookbook (which won “Best New ebook” by Paleo Magazine BTW!) 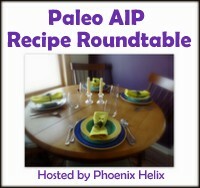 the AIP blogger community has released a new game changing cookbook for folks with chronic illness: 30 Minutes Meals for the Paleo AIP. Unlike other cookbooks, this one doesn’t feature recipes for individual dishes, but entire fricken’ meals. Each of the 120 included meals is 100% AIP Paleo compliant, and can be made in 30 minutes or less. Ehhh, are you drooling yet?? And these are only 3 of the 120 step-by-step recipes for preparing entire AIP meals! That’s dinner for 4 whole months. Like, daaaannng that’s a lot of meals. You could easily live on this cookbook just by cycling through it 3 times a year. Here’s another reason why this ebook is kinda amazing: since it’s made up of “meal recipes” it actually includes over 300 individual recipes. And it’s only $18.90, which works out to 0.063 cents a recipe. Or approximately stupid cheap. So it’s a steal, but that’s not why I really think the 30 Minute Meals for the Paleo AIP is such a winner-winner-chicken-dinner. Nope, it’s cuz its entirely meal-based. Especially when dealing with major fatigue and/or brain fog, having a cookbook that features complete meals, not just independent recipes, is a freakin’ Godsend. Think about how to put said different dishes together in a way that’s tasty. There’s no guess work here. You don’t have to think about anything. Just find a meal that looks yummy (all of them) and follow the simple step-by-step directions from start to finish. You’ll have 4 servings, table ready, in 30 minutes or less. Can I get a “Alleluia”?? For all the aforementioned reasons, the 30 Minute Meals for the Paleo AIP makes cooking allergen-free, nutrient dense meals soooooo much easier. And not just for those of us who are used to cooking meals and having the kitchen double as a pharmacy. It’s also an incredible resource for folks who require the help of loved ones or caregivers in order to stay nourished. In fact, this ebook is perfect for anyone who’s helping another to manage their symptoms & create a New Wellness. Maybe you’ve been wanting to cook meals that will help your loved one or client eat better and feel less inflamed, but have struggled or felt overwhelmed by allergen-free meal preparation. Well, 30 Minute Meals for the Paleo AIP makes cooking healing meals as easy-peasy as possible, whether it’s for ourselves or others. Case in point: Until now, Wonderhubs never used ANY of the cookbooks or ebooks I got. For several long years Wonderhubs was my primary caregiver, and he helped with the majority of my cooking. Yet, even with all that experience he never felt confident with planning meals from individual recipes. 30 Minutes Meals for AIP Paleo allows loved ones and caregivers, who are supporting another’s healing to prepare flavorful meals that are free of all major allergens, easily and without spending a ton of time in the kitchen. Which is the #1 reason I wish I’d had this resource years ago, while I still required daily caregiver support. It would have made things soooo much easier on both me & my various caregivers during my years of healing chronic Lyme disease. So if you’re caring for someone who’s living with Chronic Illness, I seriously recommend this cookbook. Cooking up these tasty AIP Paleo meals is a powerful way to support the wellness of the one you’re caring for, especially if they’re navigating Lyme or autoimmune disease. Okay, first of all, if that’s you, guess what? That’s me too. But given that the 30 Minute Meals for the Paleo AIP is massive, print-published copies of this cookbook would have been cost prohibitive. Ebooks are affordable and we all want you to be able to afford this. However, Jaime of Gutsy By Nature (who’s the brain child of this community cookbook) specifically had the pages laid out in a way that would printer friendly. I know, soo thoughtful right?? So you can totally print out your favorite recipes, or all of them and put them in a binder. If you download your copy of 30 Minute Meals for the Paleo AIP onto a desktop computer, you can also drag individual recipe pages to the desktop screen and put them into folders. If you or your loved one has multiple food intolerances, these two options (printed pages or desktop folders) allow you to create a personalized collection of full meal recipes. And I guarantee you’ll have plenty of options to choose from! I seriously hope you’ll consider adding this unique wellness resource to your cookbook library. And if you’re currently receiving support from a caregiver or loved one, don’t forget to have them check it out! Pingback: Self Care Shouldn't be Static: How to adapt your self-care for each season.